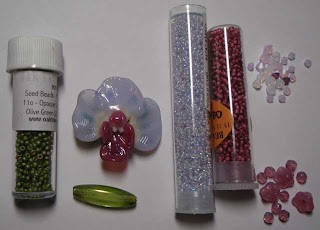 Most of my beading is done at the weekend, as I work full-time, and can't bead when tired. This morning was gorgeous and sunny, and as my workspace is in front of the East facing window, it was a lovely welcoming space. So I beaded! I have signed up to a 'goal' on the OTTBS blog of completing a Laura McCabe bracelet for my Mum's Christmas gift. My 'Bead Buddy' Jo suggested modifying the original design to leave enough left over beads for earrings and possibly a pendant, so that is the current plan. The design is the Starburst bracelet from the class we did (Jo was the organiser). This one is the colour scheme supplied by Laura as a kit in purple and silver, and I still have my own to finish but I'll do it later. I've chosen matte green 2033 to complement these colours. I have in mind a spiral staircase rope and a tassel under the focal representing the aerial roots of orchids (though not completely realistically...they aren't very attractive!). Added to the mix, though I may not use them, are some Swarovski bicones in Rosewater, Violet, Cyclamen and White (all opal) and some Czech glass flowers and facets. The long olive bead is a Guterman, from the bargain bin at a fabric shop. I also made 2 pairs of earrings for the OTTBS swap on the theme of 'Day and Night' but they can't be shown until they get to my swap partner. 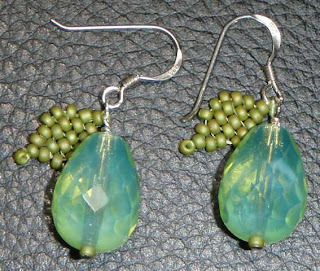 However, I was in the mood to make earrings so I kept going and made a nice pear for myself...or even a pair of pears!! 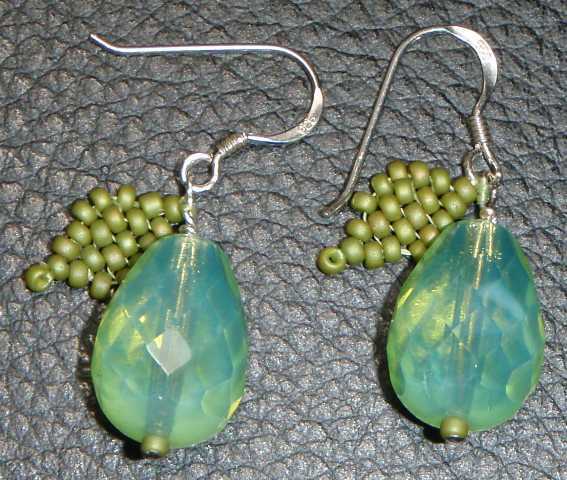 The drop beads were bought from Yashma Designs who has a lovely range of pressed and firepolished Czech beads. Coincidentally Yashma is the sponsor of this month's OTTBS moodboard, so I must remember to enter!